PHOTO BY STEVE WILLIAMS Seneca East's Amelia Boes (front) and Kennedy Beard compete during Saturday’s Tiger Classic in Attica. They finished seventh and eighth, helping the Tigers to second. ATTICA — Seneca East used a pair of top-10 efforts as the springboard to holding off Hopewell-Loudon for second Saturday in the White Division at the Seneca East Tiger Classic. Amelia Boes (21:41.83) and Kennedy Beard (21:53.58) ran seventh and eighth for the Tigers, who edged H-L 112-116 for the runner-up spot. Norwalk St. Paul won the title with 88 points, Mohawk took ninth (233), Old Fort came in 11th (282) and Lakota ended 14th (304). Morgan England added a 33rd (23:54.24) for Seneca East, Kaitlyn Cook took 37th (24:00.61) and Macy Phillips ended 50th (24:32.05). Hopewell-Loudon’s Renae Kapelka (22:55.23) and Taylor Leiter (22:57.54) crossed the line 22nd and 23rd, Corrin Hoover ran 27th (23:13.8), Ashley Brickner finished 34th (23:57.28) and Taylor Joseph took 36th (23:59.75). Maddie Fredritz’s 19th (22:34.63) led Mohawk and Maggie Wisda came in 26th (23:07.35). Old Fort’s Kristen Baker claimed 28th (23:23.34) and Allison Fortney came in 51st (24:33.68). Reilly Cozette of Lakota topped all area runners by capturing fourth (20:59.76). Brooke Shank added a 76th (25:46.8). Calvert and New Riegel did not field full teams. Calvert’s Kassidy Reynolds took 54th (24:36.31), and Grace Clouse claimed 56th (24:41.39) for New Riegel. Meanwhile, Columbian took fourth in the Black Division with 104 points, getting a seventh from Mia Ingalls (20:42.17) and a 12th from Caleigh Aigler (21:16.58). Lexington coasted past Medina 24-71 for the Black Division title, with Perrysburg (80) taking third. ATTICA — Lakota’s Dylan Moes ran second and two teammates turned in top-10 times, but Hopewell-Loudon held off the Raiders by three points Saturday to claim second in the White Division at the Seneca East Tiger Classic. Mapleton took the title going away with 61 points, with the Chieftains holding off the Raiders 129-132. New Riegel came in seventh (200), the host Tigers took 10th (289), Old Fort finished 11th (296), Mohawk wound up 15th (388) and Calvert ended 19th (441). Jordan Foster’s seventh (17:41.2) sparked the runner-up Chieftains. Carter Ritchey added a 24th (18:41.42), Caden Crawford (18:54.21) and Trey Masterson (18:54.41) ran 29th and 30th, and Bryce Arbogast had a 48th (19:36.58). Moes crossed the line in 17:01.69 to take second for the Raiders. Connor Hill backed him with a sixth (17:36.27) and Braden Schaser clocked in eighth (17:44.18) for Lakota. Ethan Smithback added a 60th (19:49.97) for Lakota and Travis Hoerig ended 64th (19:53.99). New Riegel’s Bryce Hohman ran 13th (18:03.89) and Brandon Gillig took 23rd (18:37.83). Seneca East got a 28th from Caleb Skidmore (18:51.8) and a 44th from Shayden Heiser (19:26.98). Garrett Havens of Old Fort came in 17th (18:29) and Gregory Steyer ran 21st (18:33.67). Austin England of Mohawk clocked in 50th (19:37.72) and Brock Brause added a 66th (19:54.97). Calvert’s Garrett Spaun claimed 35th (19:11.95) and Chris Laney ended 94th (20:30.45). In the Orange Division, Fostoria finished 19th (471). New London upended Edison 77-84 for the title. Dylan Sheets ran 15th (17:36.58) for Fostoria and Justin Jordan took 125th (20:46.81). NORTH ROBINSON — Carey’s Sarah Reinhart finished 14 seconds ahead of her nearest competitor Saturday to capture the title at the Colonel Crawford Early Bird Invitational. Reinhart crossed the line in 21:14.06, with runner-up Allison Farson of Elgin ending in 21:28.66. Western Reserve beat Ashland 45-66 for the team crown, with Upper Sandusky taking third (99), Carey ending seventh (162) and Buckeye Central finishing eighth (209). 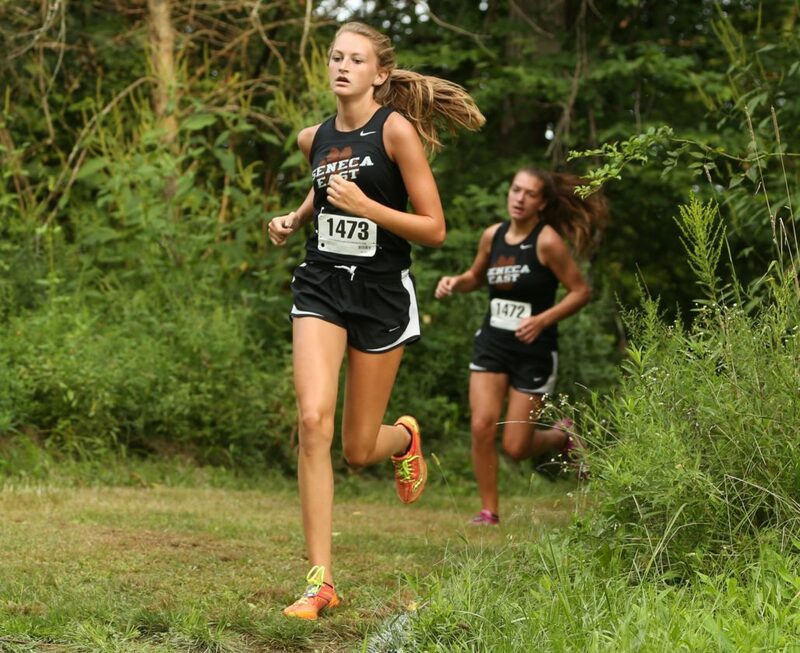 Madelyn Shasteen’s fourth (21:39.99) led Upper Sandusky and Gracie Manns ran 16th (23:02.26). Abby Allison backed up Reinhart by taking 23rd (23:35.87) for the Blue Devils. Buckeye Central got a 29th from Taylor Ratliff (23:57.93) and a 43rd from Katy Hagerty (24:49.29). Upper Sandusky’s boys claimed third in their meet with 130 points. Ashland beat Northmor 90-118 for the championship. Carey took 11th (240) and Buckeye Central came in 12th (280). Troy Mawer topped area runners by capturing sixth (17:54.92) for Upper Sandusky and Emery Pahl came in 17th (18.45.89). Carey’s Isaiah Hoepf came in 20th (18:52.37) and Tanner Stoll took 38th (19:50.09). Alex Young ended 34th (19:39.35) for Buckeye Central and Anthony Millinger added a 47th (20:03.23). SANDUSKY — Madelyn Verhoff captured seventh in the girls race Saturday to lead all Bellevue efforts at the Sandusky St. Mary Panther Run to Fun. Verhoff crossed the line in 13:10.07 to help Bellevue take third in the girls with 116 points. The meet had a 3,200-yard course. Lindsey Spurlock backed Verhoff with a 12th (13:30.35). Liberty Center beat New Philadelphia 54-76 for the championship. The Redmen’s boys got a 19th from Zach Cleveland (11:13.42) and a 30th from Cayden Adams (11:35.02) en route to ending 10th (244). Leesburg Fairfield beat St. Mary 53-90 for the title.